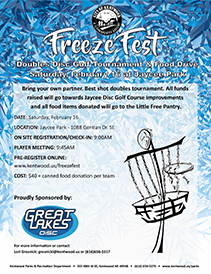 We're partnering with Great Lakes Disc to bring you another doubles disc golf tournament and food drive! Bring your own partner. Best shot doubles tournament. All funds raised will go towards Jaycee Disc Golf Course improvements and all food items donated will go to the Little Free Pantry.